Achieving a uniform and bright smile is challenging when you have teeth staining, gaps, crooked teeth, or other aesthetic concerns. At the Victoria cosmetic dental practice of Dr. Lisa Heinrich-Null, we offer patients porcelain veneers to completely transform their smiles. 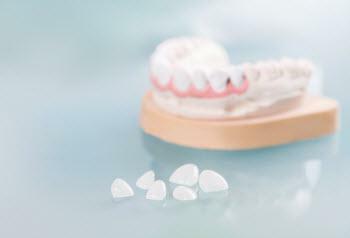 Porcelain veneers are built to restore and enhance your teeth visually. Our Victoria cosmetic dentist takes into consideration the shape and coloring of the porcelain to customize them as close to your natural smile as possible. This treatment is ideal for patients with one or more of these concerns. Our porcelain veneers can reshape your teeth and create the smile that you’ve always wanted. Porcelain is known to be a durable and aesthetically pleasing material that not only mimics the same luminosity as your natural enamel but the strength of it as well. Dr. Lisa Heinrich-Null and her experienced staff provide traditional porcelain veneers as well as prep-less Lumineers® to achieve a new aesthetic. Unlike traditional veneers which require minor enamel, Lumineers offer an alternative. Lumineers are thinner than traditional veneers and offer the same benefits of masking many imperfections. Dr. Heinrich-Null will discuss the benefits of each treatment and can help you determine which type of veneer is best for you. If your bite indicates malocclusion, prep-less veneers are not right for you. We consider your comfort and ease during treatment. Our gentle approach to dentistry ensures each patient receives quality care in a compassionate environment. We utilize high-quality dental materials and offer several forms of sedation to improve your comfort during your visit. Dr. Lisa Heinrich-Null and her team provide dedicated dental care focused on giving patients beautiful and healthy smiles. For more information on veneers, Lumineers, or our other cosmetic dental options, contact our Victoria dental practice today. We proudly serve patients throughout Raisin, Bloomington, Inez, and other cities across Victoria County.